No matter how tired I am, no matter what time I go to bed, I always wake up by 6 AM. To add to that there is excitement. The rooms at London palace are very comfortable. 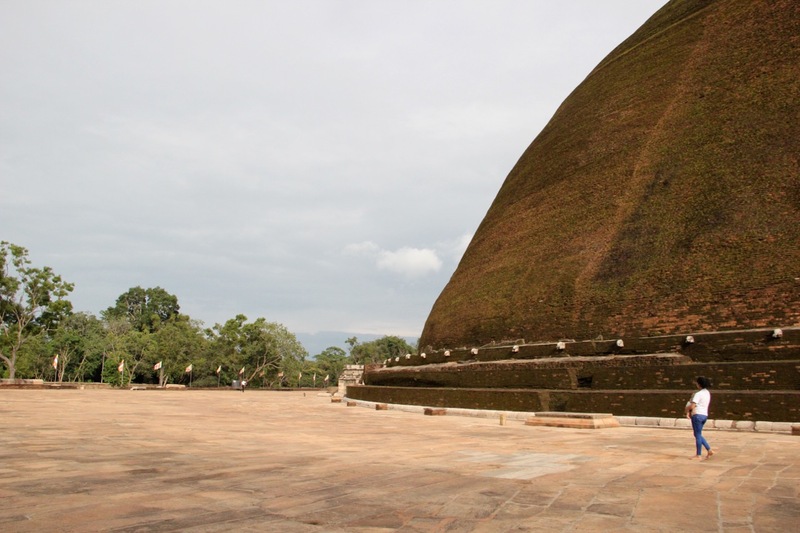 I learn from the front desk that I could rent a bicycle and see the ancient scared city of Anuradhapura. So immediately after my morning tea, I hire a bicycle at the hotel and take off. Isurumuniya Vihara and Bodhi tree are always open. Vihara is the Sanskrit or Pali term for Buddhist monastery. Chaturanga, at the front desk provides me a map and details to the historical sites. 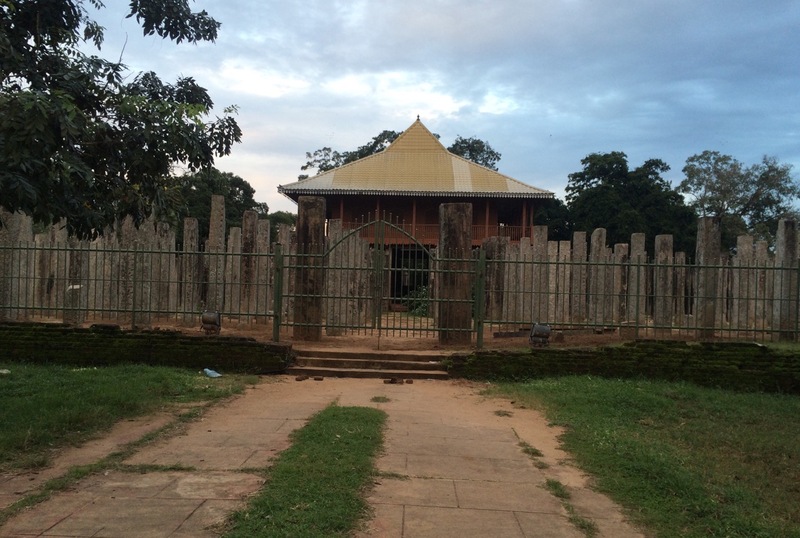 When I reach Isurumuniya Vihara, I realise that my bicycle lock does not work. I call the hotel and they tell me that it is fine to not lock the cycle. Having lost my bicycle from my own apartment in Bangalore, I am always careful with them now. But I want to believe that this is a safe place. However, I make sure I inform the security guard about it. He asks me to park it within his eye sight. I buy my entry ticket and go in. A few months ago, even before I knew what to expect from Sri Lanka, I had a dream. In which, I stood by an unique plant in my garden. The plant bore different fruits and vegetables. It had tomatoes, onions and Chow-Chow in its branches. I wondered what this plant was and just then a rock below it transforms itself into a sleeping Buddha. Inspired from this interesting dream, I began a painting and awaited this trip to be influenced further to enrich it. 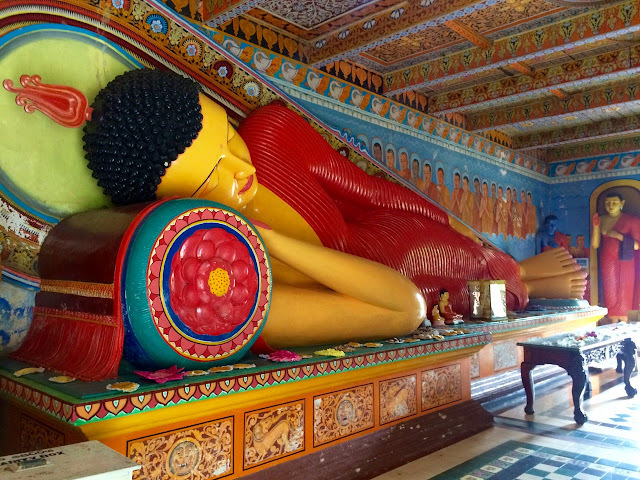 But it was only a coincidence that the first temple I visit in Sri Lanka, has a reclining Buddha idol. 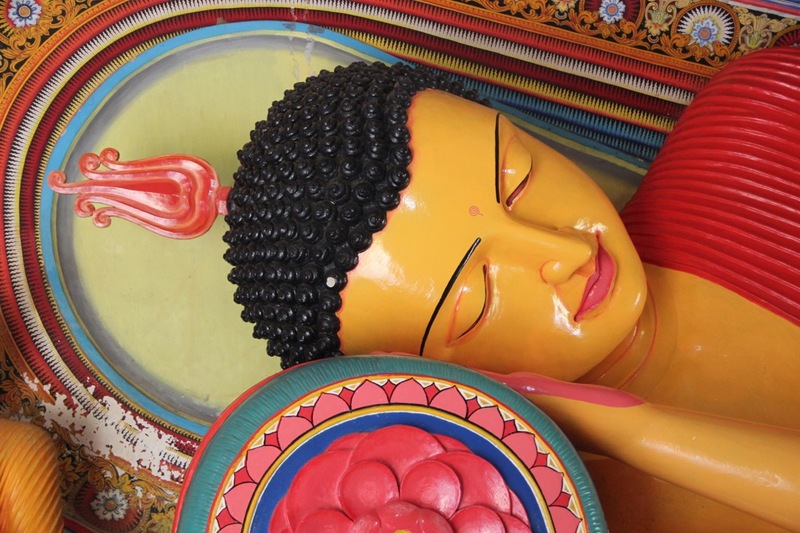 A very beautifully painted Buddha idol in nirvana state adorns the main shrine. 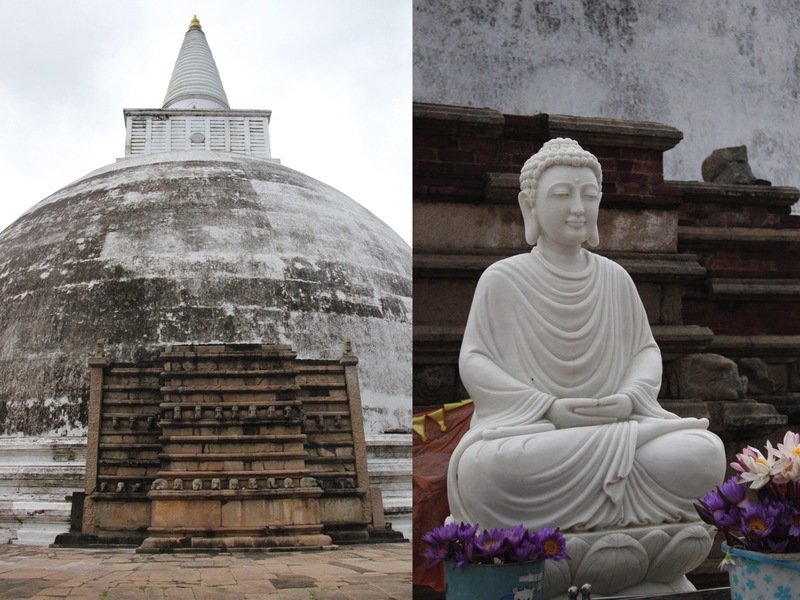 I also take a walk upto the stupa and meet a Swiz couple who are traveling with a French speaking Sri Lankan guide. The guide Anitha tells me that she is of an Indian origin and she has studied in Alliance française de Kandy several years ago. "I am ancient", she says and laughs referring to her old age. I stop at a small shack looking for breakfast. Inside the shop are a small kid and an old man who had just walked in. I enquire for food but without understanding he just says no. I am about to leave when the woman who owns the shop, who was riding away somewhere stops and asks me what I wanted. In her broken English she tells me that she can offer me some Bread and Dal. I am more than happy. Believe me, that was the best Dal I have ever had. I loved it. I try to get the recipe from her. She mentions that she uses coconut milk and onion paste but then fails to translate the other ingredients. The black tea there tasted like heaven. 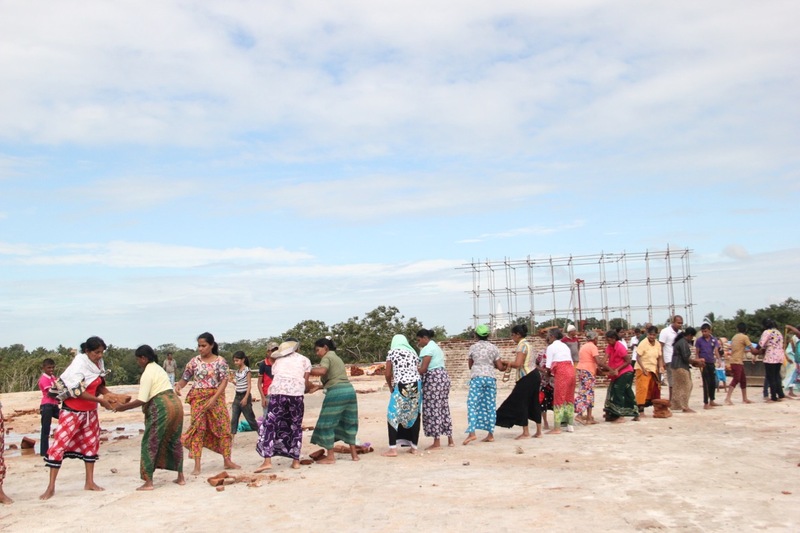 On my way to the Archeology museum, I stop at this stupa under construction called - Sanda Hiru Seya (Moon Sun Stupa). I walk up to find a crowd of villagers volunteering to build the Stupa by passing bricks. I join a group of local boys and help them and thus become a part of this historic moment. It is a great feeling being a part of something important together. On my way back, I meet the Spanish couple who are staying at the same hotel as mine and like me, they are trying to locate the museum as well. I ask them to follow me. At the museum we buy a pass for all the historic sites. Its Lrs 3500 for foreigners and half that price for Indians. The old lady at the counter takes Lrs 50 extra from me and meets my surprised look with an expressionless stare. 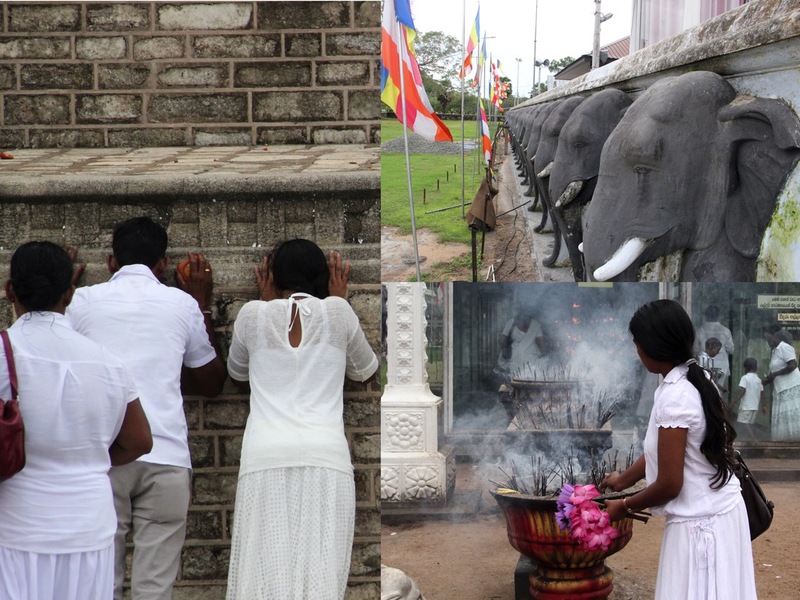 In Sri Lanka, Every temple has an entry fee for foreigners. It is always a significant amount. Varies from Lrs 300 to Lrs1000 and can go up to Lrs 3500 for historic sites. This makes some foreigners frustrated and some not so rich travellers to skip a few sites of interest. However, for Indians, as part of SAARC nation, upon showing the passport, receive a 50% off on the ticket price in most if not all places. Unfortunately the Archaeology museum itself was closed for construction. Just when I take off from the museum, a man walking by asks me where I was from. Upon learning that I was an Indian he shouts - "Welcome to Sri Lanka." I thanked him in surprise and ride away. I reach the Bodhi tree which is down the lane from the museum. 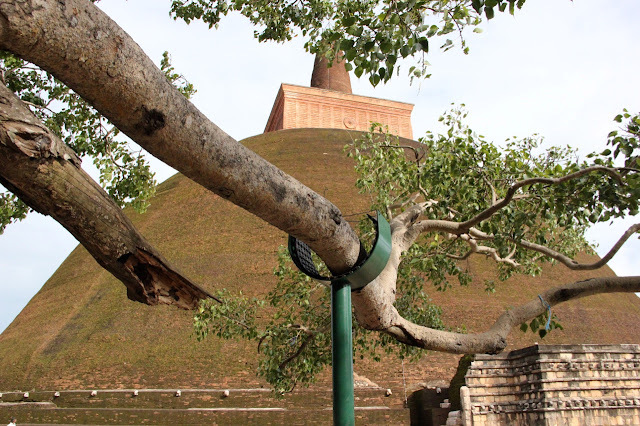 It is believed that this is a branch from the original Bodhi tree in Bodhgaya where Lord Buddha attained enlightenment. 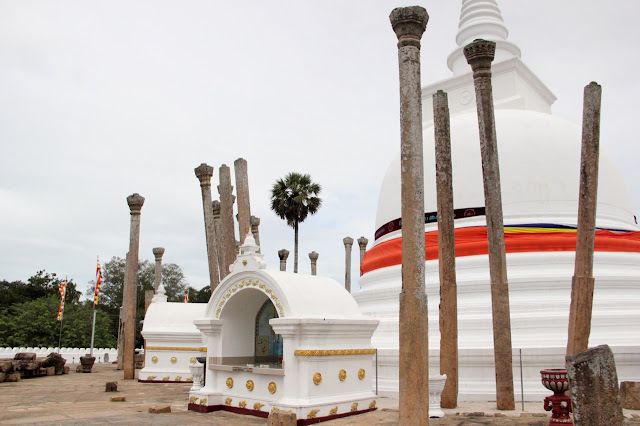 It is also believed that princess Sanghamitra, sister of Mahinda (Son of emperor Asoka, who introduced Buddha’s teachings to Sri Lanka) brought the cutting from India so that it has a connection to the geographical heart of the sinhalese religion. This place is very crowded with pilgrims and there are a lot of activities happening here when I arrive. It is interesting to see the devotees pray to the holy tree, make wishes, offer flowers and fruits and light lamps and incense sticks. The Buddha idol inside the shrine appears very tranquil. 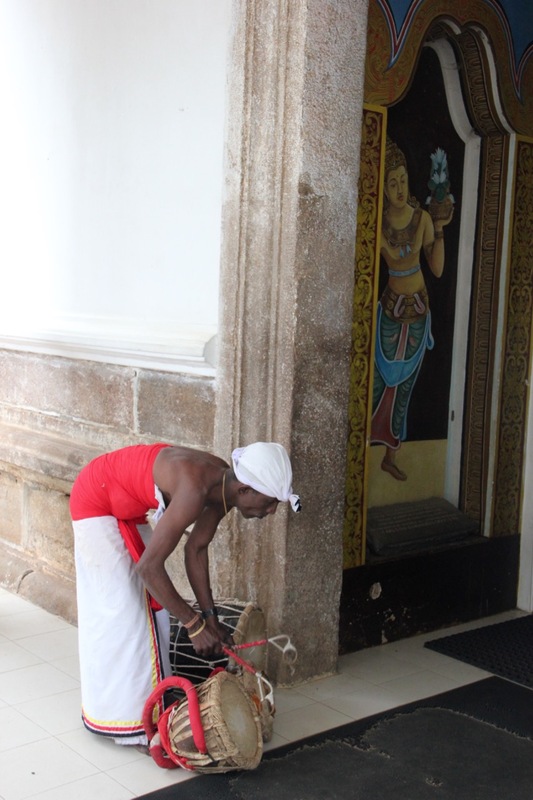 A man outside the shrine plays an instrument during the prayers. 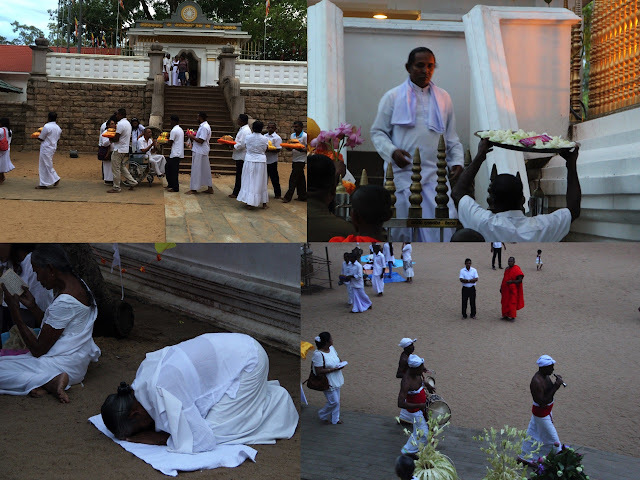 All the devotees wear White while entering the holy places and one is supposed to cover their knees. Short pants and skirts are not allowed even though white colour is not a must. 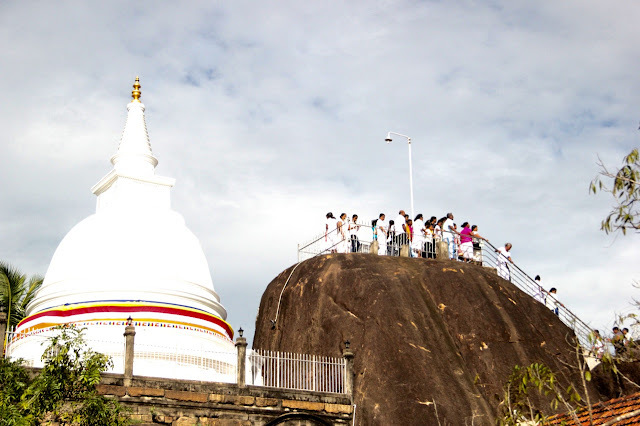 Mirisavatiya Dagoba was built by Dutugemunu after capturing the city in 2nd Century BC. Here, I meet an artefact seller from whom I buy a reclining Buddha statue carved on stone. it is a beautiful piece of art. 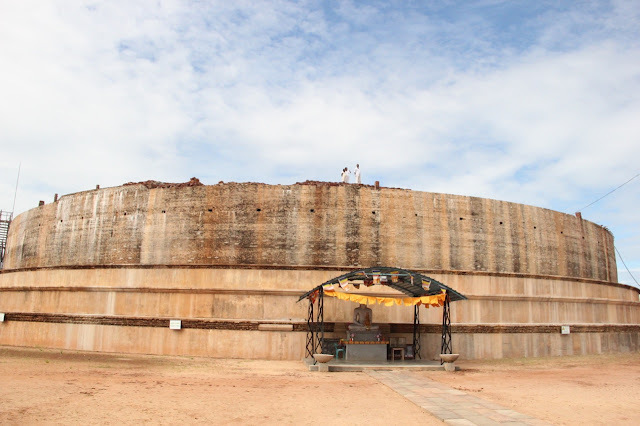 Ruvanvelisaya Dagoba (140BC) is the most popular here and on this Saturday has attracted a lot of crowd. The Dagoba is guarded by a wall with a frieze of hundreds of elephants standing shoulder to shoulder. It is here that, I meet an American solo traveler from Grand Junction, Colorado. It's nice speaking to him. 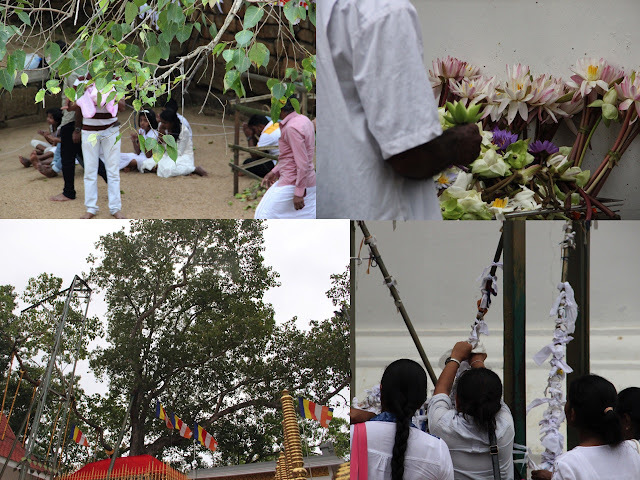 He suggests that I visit the Bodhi tree during sunset as a lot of prayer and activities happen there at that time. He wishes to travel in India but has heard about a lot of beggars and handicaps on the roads that makes it hard for him to ignore them. I tell him that it is true that this is a common sight on Indian streets and outside temples but he must learn to ignore them as it is impossible to help everyone. At times some of them could be a part of a lobby that makes people beg and earn money. So to travel in such areas one must be having a mindset to ignore them. Even though, I thought it was a typical American perspective at the rest of the world, I agree that for the westerners it makes it hard to ignore things such like this. But having traveled in the US and having seen demanding beggars in downtowns even there, I think its only a question of dealing with the magnitude. Jetavanarama Dagoba (Built in 3rd century by Mahasena) is a massive dome and is left unplastered so it looks very close to nature. 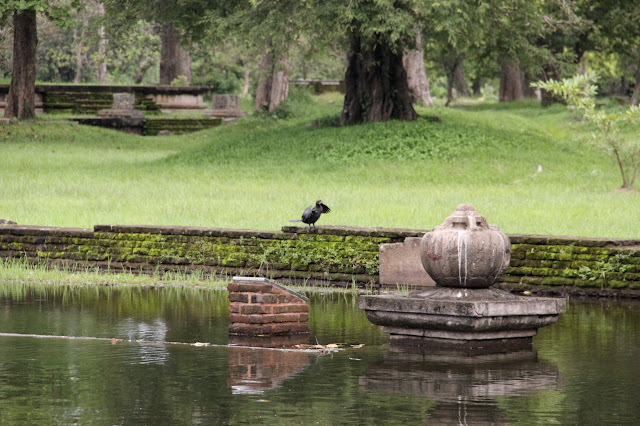 The approach road to this Stupa is via a beautiful garden with ponds by its side. I also visit Jetavanarama museum which has some interesting collection of ancient artefacts. It is also interesting to see a developed urinal system that had layered clay pots under the ground. There are several coins and sculptors from the Gupta and Kanishka periods. A very kind curator Tarangini came by to a London based Italian couple and me to take us through various artefacts. She had apparently completed her studies in Nasik and Pune (Maharastra) and knew a lot about India. Whenever we approach a sculptor related to Hindu mythology, she would let me explain it to the Italian couple. 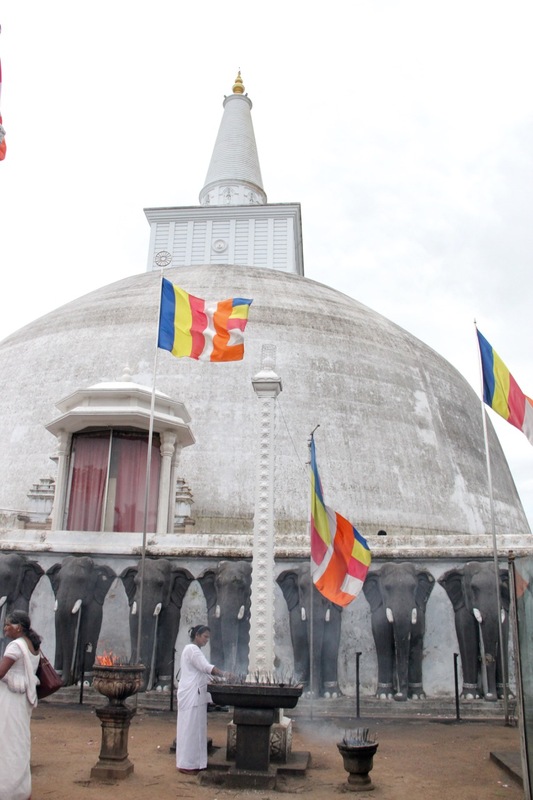 She tells us that there was so much of mixing in culture between India and Sri Lanka that lot of architecture and art was influenced by that of India. Lot of Hindu gods have thus found themselves a place in the viharas. She also helps me with a route that I could follow to cover the rest of the sites in the sacred city. 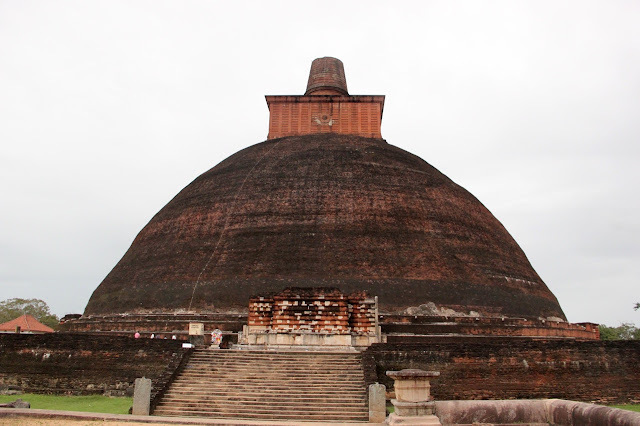 Thuparama Dagoba is the oldest in Sri Lanka and was constructed by Devanampiya Tissa in the 3rd Century BC. It is said to contain the right collarbone of the Buddha. Lot of these stupas have been restored in the previous century or so. I stop at a small hotel for lunch; rice and several vegetable curries. As always, it is delicious and little spicier than Indian food. 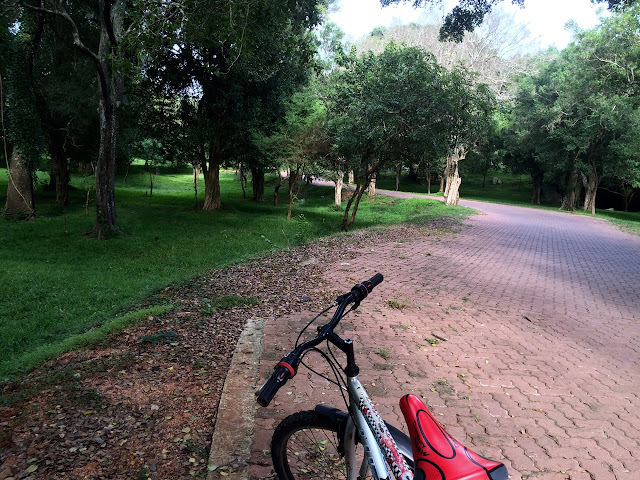 Cycling in Anuradhapura from one site to another is a lot of fun. The weather thankfully is mild and perfect for a stroll. The terrain is mostly flat and thus make it a perfect place to ride a bicycle without getting too tired. The lush surrounding only adds to this loveable experience. 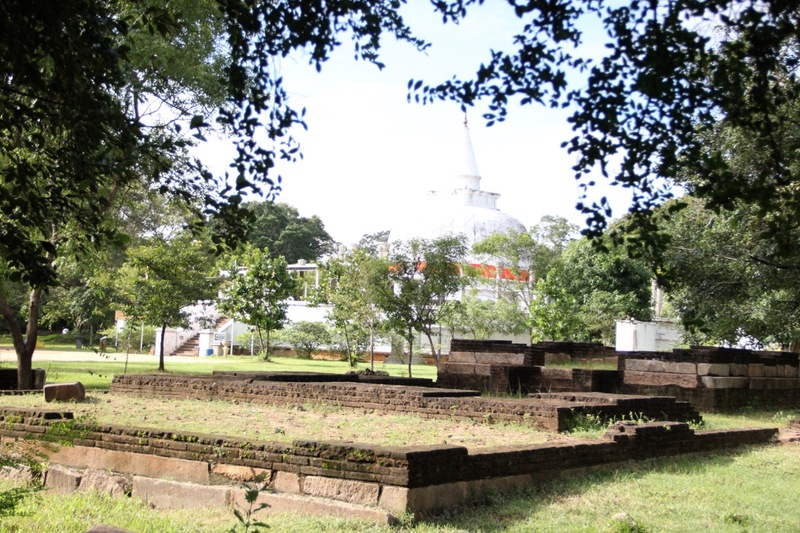 Lankarama Stupa is another located in a quiet blissful surrounding. At Abhayagiri Musuem, I happen to talk to a store keeper. This old lady tells me that she has a guesthouse nearby and its less expensive than the ones in the new town. When she asks me the name of the hotel I am staying in and I tell her, she laughs loudly. "Palace aaa? ", she adds. It is only then that it occurs to me that the name is so funny. Abhayagiri Stupa is very impressive as well surrounded by a forest. A very impressive moonstone close to the Abhayagiri stupa is considered the finest carved moonstone in Sri Lanka with different animals and birds carved on it. 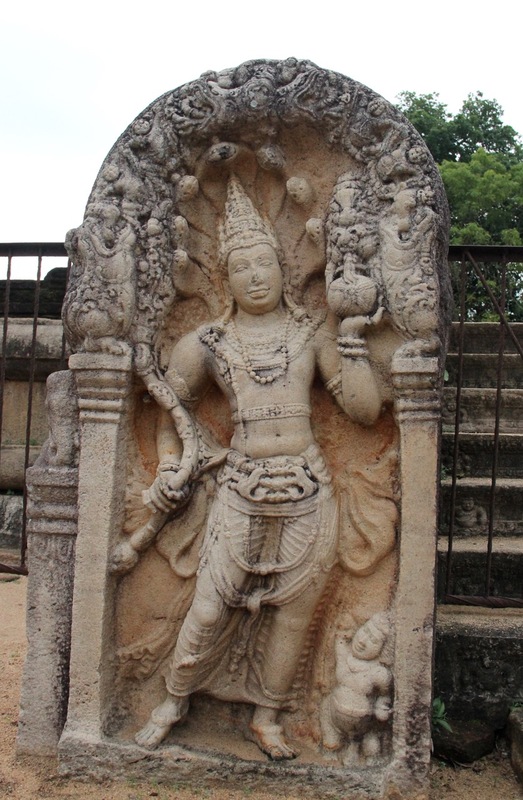 Ratnaprasada (Gem Palace) lies in ruins today but has a very interesting guard stone with a cobra king holding a vase with flowering branch (the pot of abundance signifying prosperity), with a dwarf attendant at his feet and his head framed by a cobra hood. On the outer carvings are dragon heads and two lovers emerging from them. I stop by a small shack to taste some more of local black tea. I have begun to love the plain tea more than the milk tea here. Eth Pokuna or the elephant pond when I reach there seems almost haunted. Almost I say because there is one local probably selling some food items packing for the day. The place is very serene. 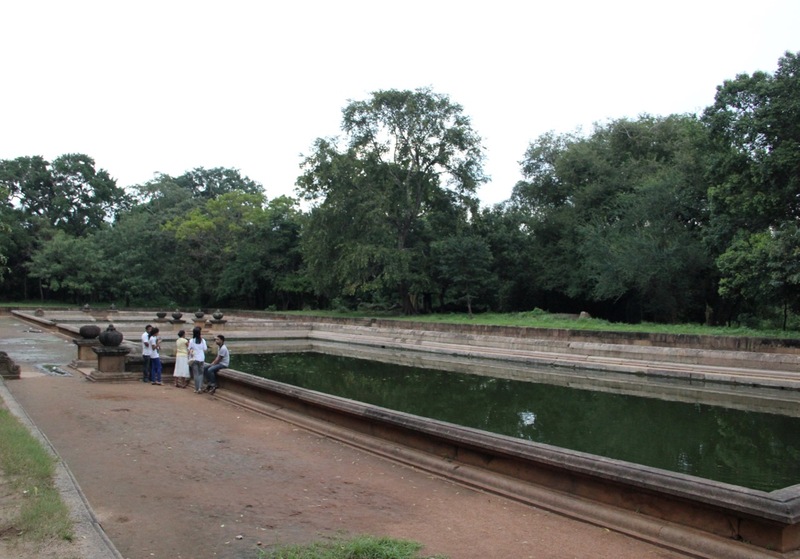 It is believed to be one of the ancient water storage pool. 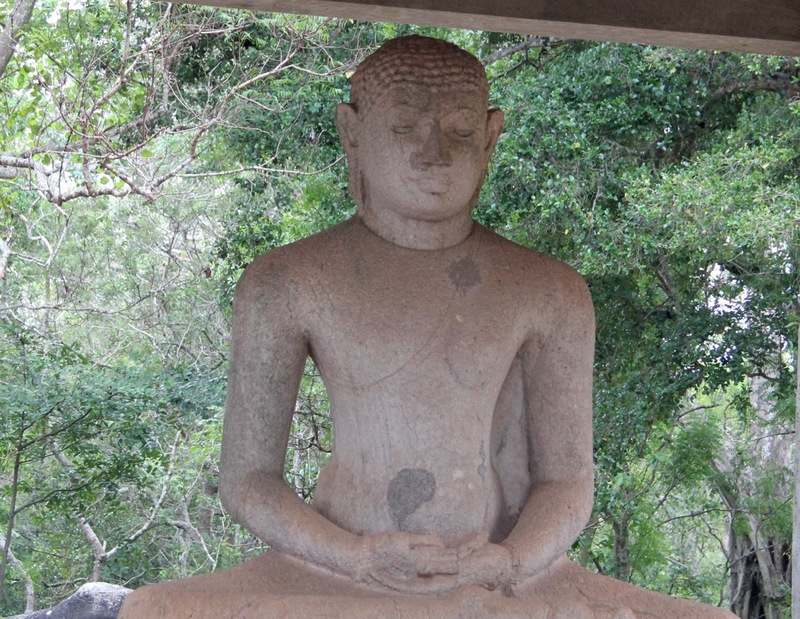 Samadhi Statue is a 4th Century statue with Buddha seated in meditation pose. 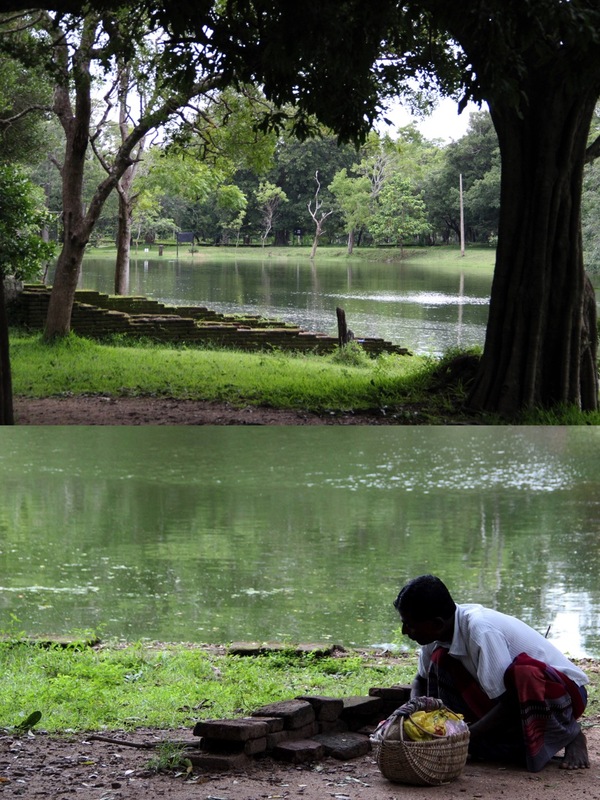 Kuttam Pokuna or Twin ponds were used by the monks of Abhayagiri Dagoba. Water enters the larger pond through the mouth of a makara and flowed to the smaller pond. I try to cover other places but get lost a little due to a bad map. On my way, I again meet the man who had welcomed me to Sri Lanka in the morning He asks me if I remember him. When I ask him his name he say, "Karu; like Karaunanidi" (Ex-chief minister of Tamilnadu). He directs me to the temple of tooth relic where the tooth relic was first supposed to have been kept (It is now in Kandy). But I still get lost and decide to skip it. I return back to the Bodhi tree just around sunset. I stop at the Brazen palace that I had missed earlier. It is called Lovamahaprasada in Sinhalese. 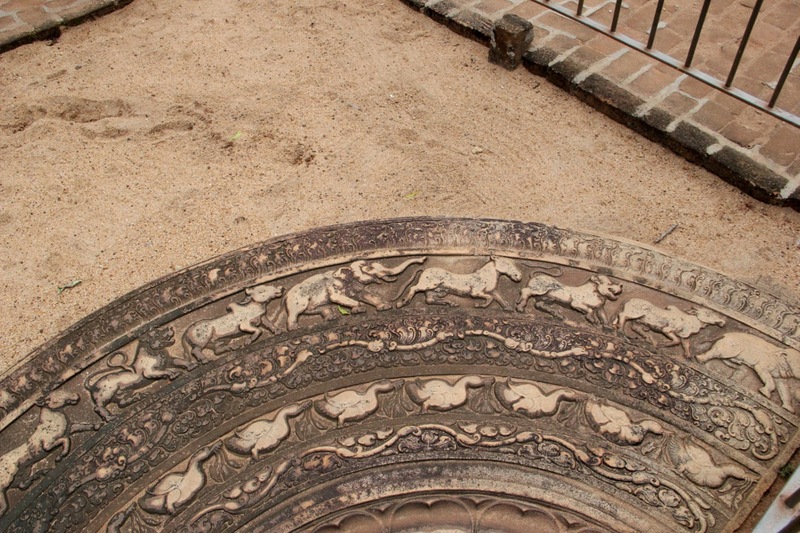 Its just next to the Bodhi tree gate on a walkway that leads to Ruvanvelisaya Stupa. All that remains now of this house for the monks are its 1600 columns. At the Bodhi tree suddenly the atmosphere has turned mystical. Several devotees carry fruits and flower offerings and walk around the tree. Other pilgrims touch these offerings to receive the blessings. The same is then brought to the topmost platform and handed to the volunteers who then take it to the tree. 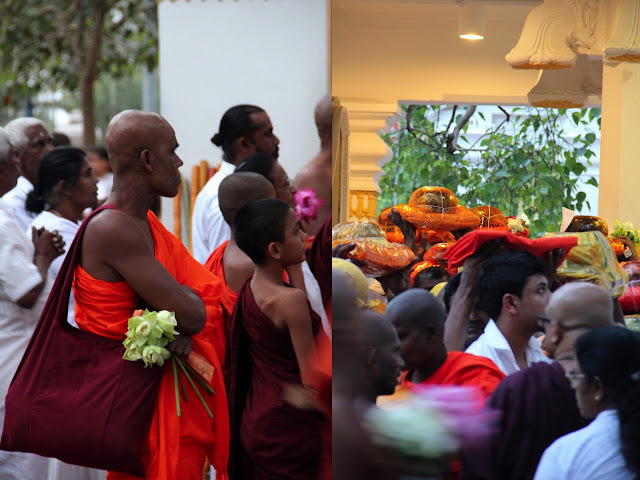 A dazzling coloured cloth is carried to the Ruwanavelisaya stupa by hundreds of devotees lifting it over their heads and then it is wrapped around the lower circumference of the stupa. 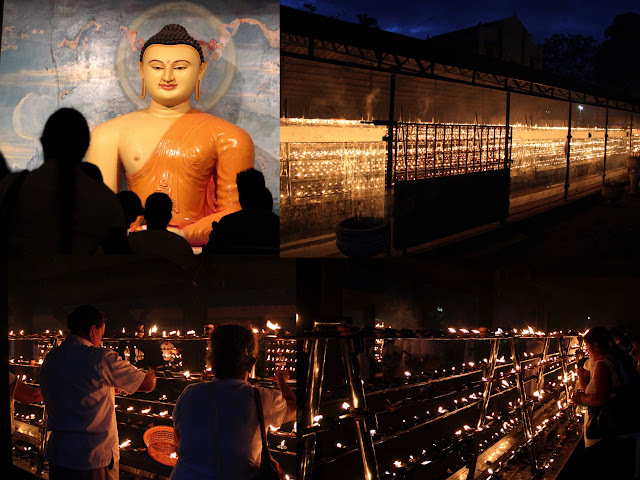 Others are busy lighting lamps outside the main premises. It seems to me then like a beautiful ending to this incredible journey in the sacred city. I return back to my hotel, tired but content. Over dinner I chat with the Spanish couple about their experiences and travels. I also feel so different about this country now. I had not locked my bicycle anywhere and no body touched it, I also did not have to worry about leaving my chappals anywhere inspite of there being so many people. Sometimes, I feel that we worry about unnecessary things in India that can be avoided easily with ethical behaviours. Above all, at the end of this journey in the sacred city, I feel blessed.